I love visiting Asian grocery markets. Thankfully these days the Twin Cities metro area has quite a few of them, though that hasn't always been the case. At first the fascination was the opportunity to shop for, buy, and try all sorts of unfamiliar foods. These days I visit them mostly to browse the ramen aisle and to supply my kimchi habit - and to marvel at the canned mushroom selection. Canned mushrooms. You might be expecting me to continue with a comparison of mushroom species eaten by different cultures, or maybe that I'm about to share some tasty, canned-mushroom based recipes. But no - my fascination with canned mushrooms is much more superficial - it's the labels. They are typically so unappetizing. The colors of the labels never seem to rest easily with the inevitable photograph of the mushrooms to be found in the can. And the photograph always seems a bit over exposed and a little too saturated; the mushrooms often seem to glisten in a way food isn't supposed to (though I admit my impression of how food is supposed to look is heavily influenced by a food-reality disconnect promoted by most food labeling that I'm used to in the US). I think the word "garish" sums it all up nicely. Why are the labels of canned mushrooms in Asian grocery stores so often unappetizing? Maybe it's some sort of cultural insider joke, like ugly Christmas sweaters. Maybe I'm the only one who views them this way, it's just a personal quirk; some combination of amateur mycologist, appreciator of thoughtful and creative depictions of mushrooms in art, and general lover of Asian food. 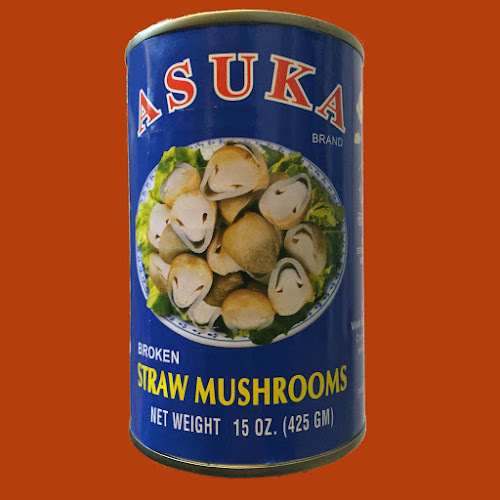 So I intend to share a series of photographs of canned mushrooms. I've had this idea floating around in my head for awhile, but I've never had any decent photographs; this is probably because I would furtively take pictures of mushroom cans with my phone while in the grocery store, always looking over my shoulder for suspicious shopkeepers and trying to block the glare from fluorescent lights. So the last time I visited Shuang Hur Oriental Market in south Minneapolis I bought about ten cans of mushrooms of various types and brands so I could take the picture in a more controlled environment. 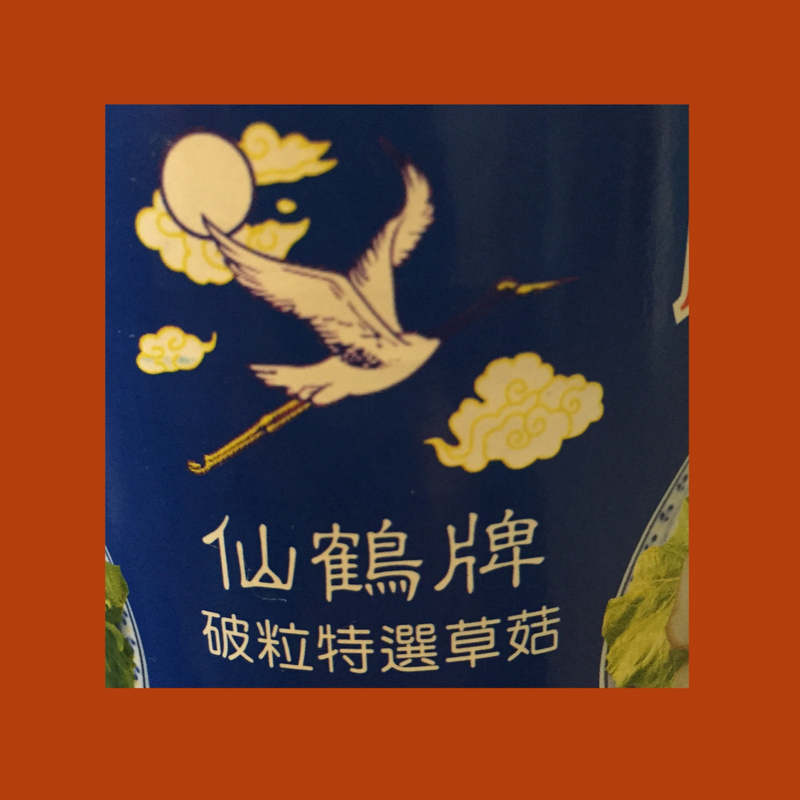 This first can of mushrooms happens to feature a Black-necked Stork (Grus nigiricollis) on the label, which is pretty cool. I like bird watching as much as I like mushroom hunting. I'd like to think of this mushroom can label as a good omen, maybe some kind of bioglyph indicating a future of excellent mushroom identifying and many additions to my birding life list. But I think it mostly just indicates a cupboard full of canned mushrooms.